Whoa… surprised I had not heard of these - very cool!! Do they require a special gun to fire or will any old pneumatic finish nailer of the proper gauge shoot them? Mentioned at: https://www.shapeoko.com/wiki/index.php/Workholding#Fasteners (and now I’ve added a link here, so it’s a circular reference). @WillAdams, I’m forced to wonder how you keep such prodigious index of the wiki. I swear I go there, look around, search, find nothing… then come here and ask and you post a link!!! Please let us know of any instance of looking for subject in this place but it’s not found because it’s instead over there. See this topic at that link. The big problem is the wiki has grown organically since it was first set up — while early on there was some effort to combine / tidy up pages (at one time there were 3 or 4 different pages listing parts/B.O.M./kit contents or some such), it’s reached a point which matches how I think about CNC, and I just use it as my personal notebook of material I might want to reference — it would be nice if it were more generally useful, and there are a couple of Overview and basics pages which ought to be folded into the main page probably, but when I’ve asked in the past, no one has had any suggestions on it. The problem here is that Workholding is one of the longer pages — probably there should be a discussion at the top of all the possibilities as there are on the various Overview pages. According to Raptor, you’re supposed to use a nail gut that has a pretty tight tolerance in driving the nail straight down. If it goes at an angle, it’ll break. The Omer is supposed to do that. But if you have a 15 ga nailer, it’d be worth it to try shooting nails with it before buying the expensive Omer. I’ve found them kind of hit-or-miss. I love the idea, but haven’t had very good luck with these. @pw8 are you using this for work hold-down during jobs with wood, or using it as intended for assembly of finished work? I’m using it for work holding. 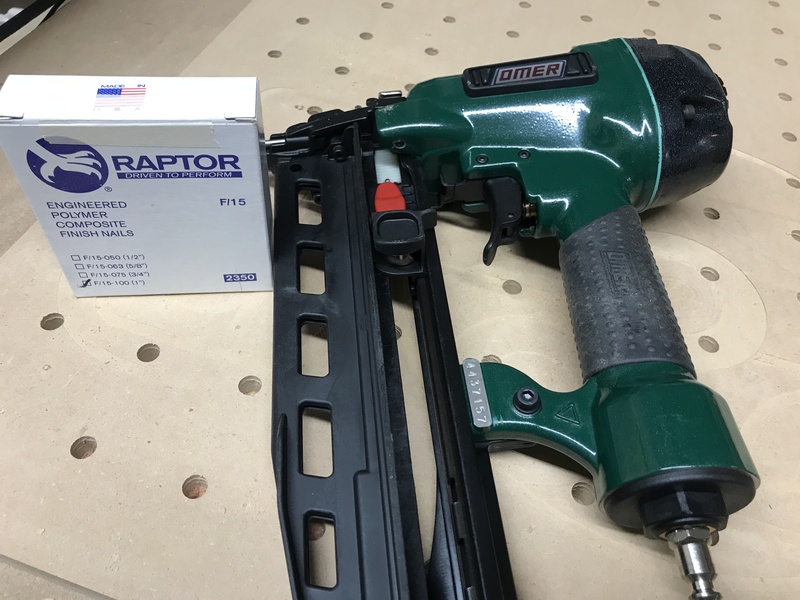 Raptor markets work holding as one of the purposes for their polymer nails since it can hold wood securely but makes removal easy due to its low shear strength. Another key point is that you can machine right into it without damaging your bit. 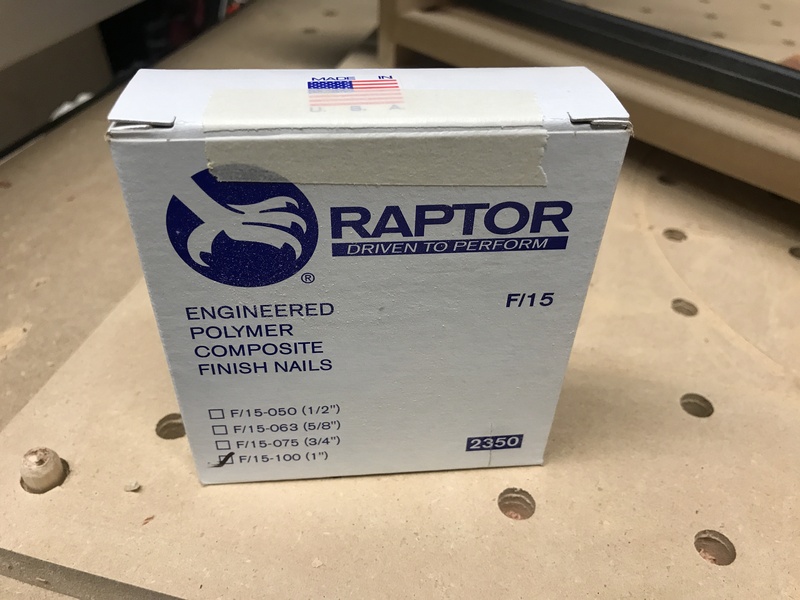 I plan on building some speaker boxes for my truck and since it’ll be a relatively large size, I think the Raptor nails will give me a maximum work area since I don’t have to worry about clamps and such. Well that seems pretty darn cool then, I’ll have to check those out! How hard do you have to hit the work piece to break it loose? Do you use a rubber mallet, or a normal hammer? Are the nail heads or shafts visible on either side of the wood after it’s done milling? Are you driving them through the part that you’re milling (with no tabs designed in), or leaving work-holding tabs in your design and then using these just on the perimeter of the piece where clamps would go? Very cool. thanks for the answers, @pw8!